The story of Blaine Memorial United Methodist Church began over 100 years ago with the formation of the Seattle Japanese Methodist Episcopal Church in 1904. The first motto of the fledgling congregation were the words from Mark 12:30-31, “Thou shalt love the Lord thy God with all thy heart, and with all thy soul, and with all thy mind, and with all thy strength. This is the first commandment. And the second is like it, namely this, thou shalt love thy neighbour as thy self.” Over time, the church outgrew its initial buildings until the congregation built their first permanent sanctuary on Washington Street in 1912. 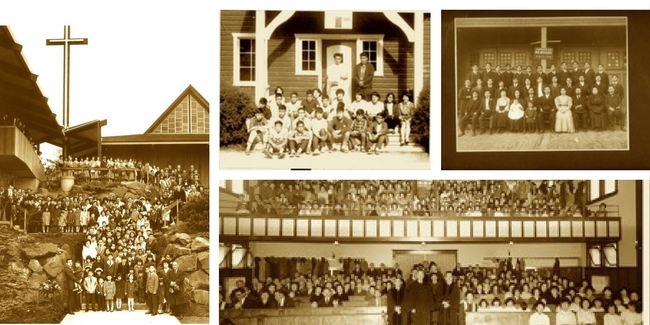 The church served as a social focal point for Japanese immigrants as it continued to grow, facilitating English language classes, connecting members to jobs, and finding housing for new immigrants. It also served as a spiritual and social buffer to the virulent anti-Japanese movements that began to gather momentum along the West Coast prior to World War II. After the bombing of Pearl Harbor on December 7, 1941, despite substantial government evidence that the Nikkei (persons of Japanese heritage) community did not pose an espionage threat, momentum toward mass incarceration of Japanese immigrants and Japanese American citizens developed in Congress and the Executive Branch. On February 19, 1942, President Roosevelt signed Executive Order 9066, which allowed the Army to exclude any individual from designated military zones, but the order applied primarily to Nikkei. In the midst of this heartbreak and turmoil, hope came in the form of Mr. E. L. Blaine and other members of Seattle First Methodist Church, who agreed to watch over the church building and the affairs of the church until the congregation and its leadership returned. The congregation requested to be interned together as a group and was initially evacuated to “Camp Harmony”, the Puyallup Fair Grounds Assembly Center. In August 1942, the internees were moved to primitive barracks at the Minidoka Relocation Center in Idaho. Many church members served in the 442nd-100th Regimental Combat Team, the Military Intelligence Language Service (MILS) or the US Army Counter Intelligence Corps. These men distinguished themselves at places with names such as Bruyeres, Belmont, Biffontaine, and Mt. Folgorito. They successfully rescued, at great cost, the Lost Battalion of the 36th Texas Division, and will always be remembered for their heroic and successful attack on Hitler’s Gothic Line, which led to the end of combat in Europe. After the end of the war, the relocation centers were closed, and church members began to return to the Seattle area and the hostile public attitude toward the returning Nikkei. However in the midst of these struggles, hope existed. True to their word, E. L. Blaine and the trustees from the Seattle First Methodist Church had faithfully watched over the church while the congregation was gone and nothing of the church or the contents stored within were damaged. In 1956, the church was renamed for Mr. E. L. Blaine, fifty-two years after he had helped form the fledgling Japanese Methodist Episcopal Church. Without his continued assistance in the years since church formation, it is unlikely the congregation would have had a church to come home to. Mr. Blaine passed away in 1954, and in 1956 the congregation voted to honor his lifelong dedication to this church by renaming it Blaine Memorial United Methodist Church. The church moved to its current location on Beacon Hill in Seattle in 1962. Mr. Blaine and Seattle First Methodist gave this congregation a priceless gift of love and a legacy of service to neighbors. It is a debt and an obligation which, while it can never be repaid, can be carried forward forever as an example of Christ’s boundless love and service to others. Since the 1960s, the congregation has grown and changed. Our church family is like a tree which has grown over the years, and with every passing year, new branches sprout from its sturdy roots. But one thing will never change – our congregation will always be a place where anyone may find peace, learn about our relationship with God, and find a supportive community where one can serve others in love. Because of our unique church history and our witness to injustices of the past, we believe we not only must serve others, but we also have a special duty to both speak out on behalf of and support oppressed communities and individuals, because we have experienced these ourselves. We invite you to visit and experience worship with us!